Developed by Every Single Soldier and published by Slitherine Games/Matrix Games, Afghanistan '11 is the new version of a unique game formula first utilized in Vietnam '65. In both games, combat is only a means to an end: winning the hearts and minds of a nation. 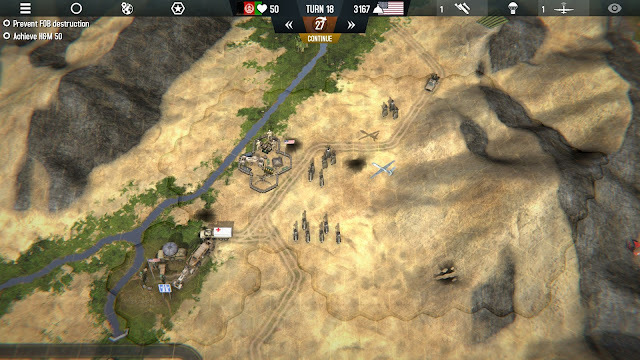 In Afghanistan '11 (A11) the player must deal with multiple new layers of strategy in order to achieve that goal. To get a look at the flow of the gameplay, check out my two part AAR. Dealing with an insurgency is one of the most frustrating problems for modern military forces. Fighting a enemy that appears from among the civilian population, and then fades away again, makes conventional tactics far less effective. All the tanks and fighter jets in the world won't help you defeat an ideology, if the local people support it. This leads us to the key to victory in A11, winning over the local population to your cause. The strategic overview screen helps you keep track of the big picture. 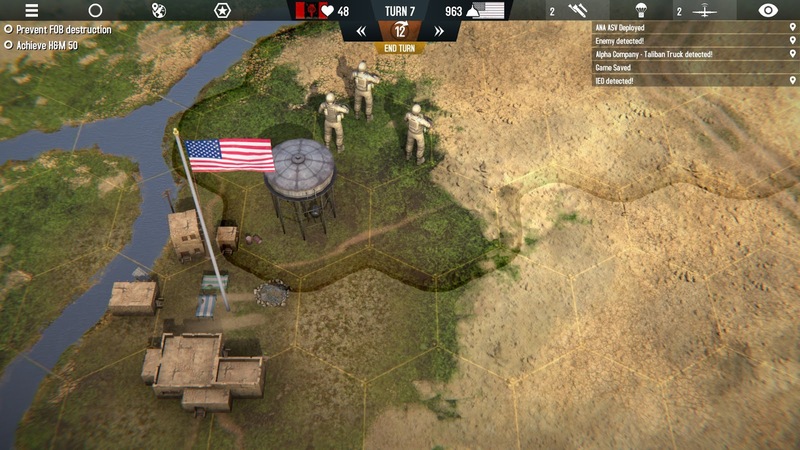 Players in A11 will certainly spend a lot of time sending troops into battle, ordering airstrikes, and deploying special forces via helicopters. However, most of these actions will be done in support of more strategic objectives like clearing IED's from highways, connecting isolated villages with roads, and sending supplies to those villages to earn their cooperation. To keep operations running smoothly, the player will also need to consider logistics. Every unit in the field only has enough rations/fuel to operate for around four or five turns before it needs return to base or be resupplied. Supplies can be delivered by truck, helicopter, or emergency drops. To really be effective, the player will need to build Forward Operating Bases (FOB's) in order to project their power further out from HQ. A supply convoy moves south as Taliban forces descend on FOB Bravo. There is another important factor the player must consider at all times: Political Points (PP). Every new unit brought into the theater, every casualty sustained, and even every movement a unit makes will cost you PP. Defeating enemy forces and clearing away opium fields, among other actions, will bump this number up. 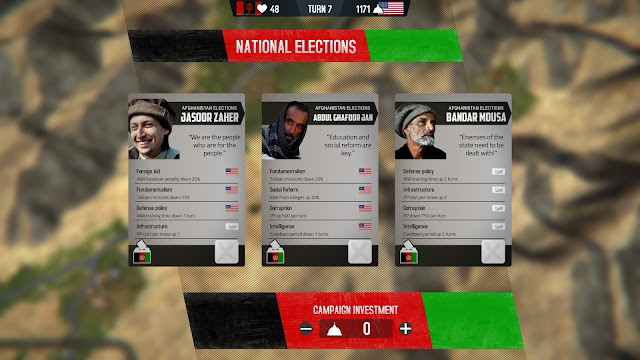 The player is also able to influence the occasional election of a new president of Afghanistan using these points. A more friendly government will make your life easier, while a pro-Taliban leader will make life miserable. Pick who you will support and if you will spend PP to help him win. As you can see, A11 mimics the troubles of the real conflict on several levels. Simply running around fighting the militia and Taliban groups active on the map will get you nowhere. These enemy forces have no base that you can destroy, and will never stop coming at you. Instead, the player must keep those foes at bay with one hand, while building up infrastructure and civilian relationships with the other. A11 is a turn based game in which each of your units has a specific number of action points they can use to move, fight or perform other actions each turn. There are about a dozen different unit types, each with an important role to play in your strategy. Infantry units can go into villages to collect intel, sweep an area around themselves for IED's, and of course fight the enemy head on. Husky mine sweeping vehicles are crucial for keeping roads and highways clear of IED's so that you can move convoys of supplies and troops around the map quickly. Don't leave home without one, seriously! Transport trucks are a cheap way to resupply FOB's and take UN aid to villages, while the far more expensive Chinook helicopter does the same job with the advantage of zipping around through the air. There are also Blackhawk helicopters, MRAP transports, special forces squads, artillery, and engineers to build things. If you have the PP available, you can call in Stryker APC's and Apache gunships to add some serious firepower to the battle. The game has an effective series of tutorial missions which teach you about all the different units and how to use them. The tutorial covers the basic strategic concepts needed for victory, but it will still very much be a trial by fire when you take on your first real mission. This is because the gameplay is open ended and lets you as the commander approach a mission in whatever way you see fit. Will you build up a network of FOB's and roads to create a permanent presence all over the map, or will you bring in numerous helicopters to move everything by air. Likely you will need a mixture depending on the the local terrain and distribution of villages. There are two different ways to play the game, either the 18 mission campaign based on real world events, or the randomized skirmish mode. 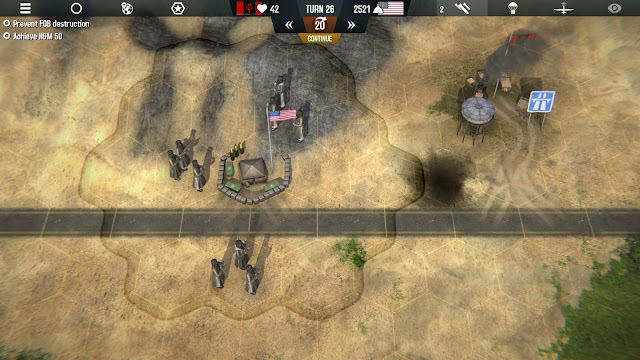 The scenarios take the core gameplay and add a few twists, but the skirmish mode alone will keep any player busy. Let's take a spin through what a typical skirmish match entails. You will begin the game with an HQ and nothing else. Looking out across the randomly generated map you will see a highway, some roads, mountains, deserts, maybe a river, and the key feature that the game revolves around: villages. Each village has a flag indicating its current political leaning. Keep the villages leaning towards the government or coalition and you will have smooth sailing. Let a village slip into the grasp of the local militia, or even the Taliban, and that area of the map becomes more dangerous. There are several actions you can take to get those villages on your side. Using your engineer units to connect those villages to the main highway and build a water supply is the most permanent way to accomplish this. However, it requires a significant investment of PP and time. Additionally, that new infrastructure then becomes a target for your enemy and forces you stretch your forces even further. You can also win hearts and minds by delivering UN aid to the villages using either supply trucks or Chinooks. This is an especially good way to influence the more remote villages that you may not be able to reach otherwise. Clearing IED's and destroying enemy units will also boost support in your favor. The sum of your efforts will be shown in the hearts and minds score, always visible at the top of the screen. Your goal in a skirmish is to get this number past a certain threshold and keep it there until the final turn. Keeping it high will help with the presidential elections which occur a few times during a typical match. Getting a more favorable candidate in office will often make your actions cheaper and enemy actions less frequent. Let that score lapse and your PP will start slipping away. If your political position back home gets too abysmal the game will end prematurely. Now, while you are working to win the people over to your side, what is the enemy doing? Enemy forces come in two flavors, numerous yet weak militia and the more resilient Taliban. The militia forces will pop up all over the map, and then attempt to place IED's and cause other trouble for you. One hit from any of your combat units will either destroy them or send them scattering in every direction. Taliban units will initially only appear along the eastern edge of the map, representing Pakistan, and then move in to try and influence villages and cause other problems. These Taliban groups take two hits to destroy. Hit them only once and they will flee momentarily, only to regroup and continue with their mission. If a village falls completely into the grasp of the Taliban, they will then begin spawning nearby. Combat in A11 is simple on the surface. Select a combat unit and mouse over an enemy to see your percentage chance of winning. Click to carry out the attack and hope for the best. The strategy comes in deciding which units to use for combat and when. It is always favorable to destroy the enemy by using artillery, airstrikes, or gunships, because sending in ground forces carries the risk that they will take casualties or even be destroyed. Losing a unit this way is a real one-two punch, since you lose political points immediately and must spend more to replace that unit. FOB's come with a free mortar unit for defense, but it has limited ammunition. More ammo must be brought in from HQ to keep the shells flying. Heavy artillery guns can also be brought in to an upgraded FOB if you need serious defense. Funding cuts can make a difficult situation even worse. This is a good time to discuss upgrading FOB's. When a FOB is initially placed, it serves as a safe harbor in the field for your units. Units resting there will be slowly resupplied, but cannot replace their losses. 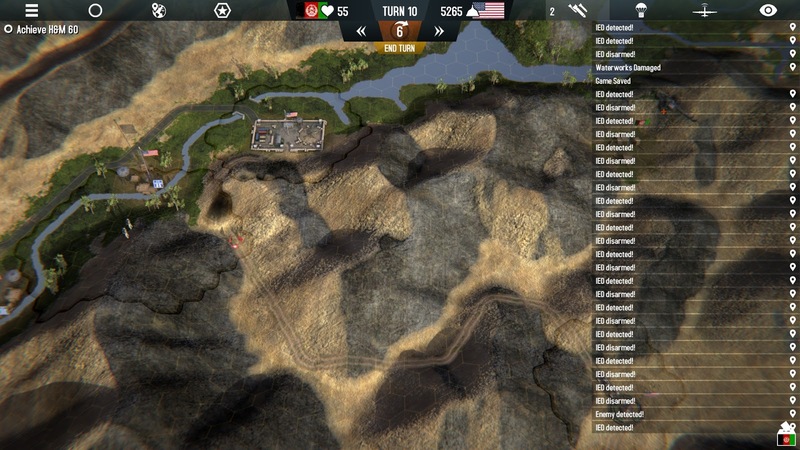 You can choose to add on to a FOB with a field hospital, vehicle repair yard, and/or heavy artillery pit. These upgrades are expensive, so you must decide which FOB's are worth upgrading, and to what extent. A fully upgraded and supplied FOB can allow you to maintain a powerful force far away from your HQ. The logistics of keeping that FOB manned and supplied is something you will need to plan ahead of time. Another item you must consider as part of your long term strategy is the training of the Afghanistan National Army (ANA). On specific turns you will be expected to have achieved a certain ratio of ANA to coalition combat units in theater. Towards the end of a match you will be forced to hand complete control over to the ANA, so you need to have stabilized the area by that point if you don't want to watch all of your hard work be wiped away. Training the ANA is one of the jobs of your extremely useful special forces units. While stationed at your HQ, these units can train ANA artillery, APC, and helicopter units. Move them out to a FOB and they can begin training ANA infantry. The ANA troops are not as good in combat as the American forces, but are better for visiting villages. Did I mention the part about visiting villages yet? Like I said at the beginning, this game has a lot of strategic layers happening all at once, which made it difficult to find a logical flow for this review! Anyway, each village has a campfire in it that will begin to burn whenever new intelligence is potentially available. You will need to send in an infantry unit to visit with the village elders and see what they can learn. Sometimes your men will come up empty, but other times the location of an IED, opium field, or enemy unit will be revealed on the map. An exposed enemy unit makes easy prey for an airstrike. Getting eyes on the enemy is always the trickiest part of combat in this game, so revealing units in this way is very helpful. The availability of intel in a village will refresh over time, so you will want to be constantly sending out patrols to keep the information flowing. This means that your units can't just sit around in their FOB's, they must be constantly moving around the map. Again, this is where logistical planning early on can pay dividends later. That is a lot of IED's. Remember, always bring your minesweeper on any ground expeditions. That point, long term planning and logistics, is really what makes this game compelling in my eyes. It's not a game where clever tactical maneuvering of your forces matters much, and it's not a game where putting the biggest weapons in the field will bring you victory. This is a game where thoughtful planning of a strategy requires thinking through how you will keep that strategy in motion. Ultimately, supply trucks and engineers are more critical to your mission than Apache gunships. Of course, that Apache might need to be on hand to save those supply trucks from a surprise ambush! I find it difficult to come up with anything I greatly disliked about this game. The combat could perhaps be more interesting, especially in terms of infantry combat, but that is not really the true focus of the game. The game can be very frustrating at times, but that is a direct result of the mechanics imitating the real conflict, and not an issue with the game itself. One problem I had with Vietnam '65 was that you essentially played the same scenario every time, with only the terrain changing. 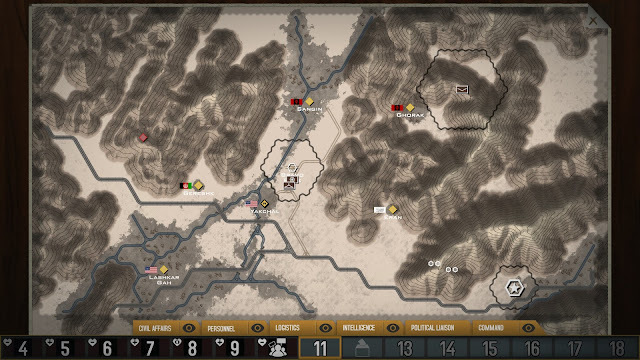 A11 addresses this issue with its lengthy campaign of hand crafted scenarios, each with unique goals added in to the standard game loop. 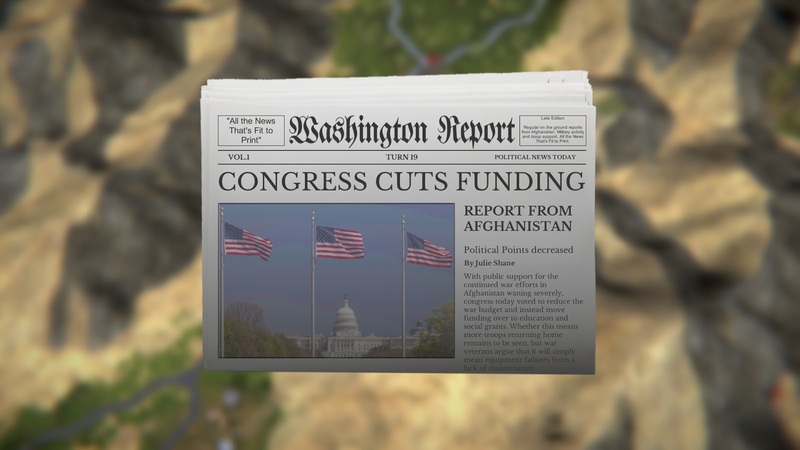 Afghanistan '11 is a significant step up from Vietnam '65, improving on that formula in every way to create a much richer experience that draws fresh ideas from its setting. I give this game a strong recommendation with my usual caveat that it won't be for everyone. If your groove is tactically maneuvering units to achieve fire superiority and outflank your foes, you won't find that here. However, if you enjoy big picture strategy and careful planning, this game has it in spades. There are so many factors pulling for your attention that you will have some sort of interesting decision to make every turn. I look forward to seeing where they take this series next, and how they will top this experience. Afghanistan '11 releases March 23rd and is available directly from Matrix Games or on Steam. Great game review. I was at first skeptical because of the price but couldn't resist in the end. I was waiting for a game that depicts counter-insurgency efforts in Afghanistan and this is the best shot at the topic for now. At times, I find combat results quite weird. A group of Taliban in open terrain surviving everything that's being thrown against them just doesn't feel right. However, the combination of game mechanics make for a very interesting and challenging experience. Thanks for your review! Thank you for reading! Yes, I would agree that the direct combat feels like it could use more nuance at times. I think it's just really difficult to model accurately at this scale, so I just imagine it as being more abstracted. Whilst I do not disagree with your comments, did you actually play a scenario to the end? - I doubt it because the game is not playable to the end. Constant new versions are brought out to address various issues which means having to restart a scenario from the beginning every time, so you have wasted many hours of play.